Hey Oklahoma! Engagement season is around the corner and you need a reliable jeweler that can help you choose and personalize one of the most important pieces of jewelry you will ever buy: your bride’s engagement ring. With the largest selection of bridal jewelry in Oklahoma, Lewis Jewelers of Moore, OK is the obvious choice. This year Tim and Glenn Lewis celebrate 40 years in the fine jewelry business. Their passion for fine jewelry and the joy they bring to their customers is why Lewis Jewelers is our Coast Diamond Featured Retailer of the Week. Glenn and Tim Lewis started Lewis Jewelers 40 years ago, when they were 21 and 19 years old. Tim and Glenn Lewis have had a passion for gemstones since they were kids. Their curiosity with rocks grew into the extraordinary ability to cut and polish diamonds and gemstones, so brilliantly in their own factory, they are considered the best among their peers in the southwest United States. You need to know… Lewis Jewelers was the first jeweler to be selected to sell the De Beers Forevermark Black Label diamonds four years ago. How extraordianry is a Coast Diamond engagement ring is with one of these brilliant diamonds selected at Lewis Jewelers! When you visit the amazing selection of Coast Diamond engagement rings and the extraordinary diamond experts at Lewis Jewelers you will experience the touch and see the radiance of the Coast Diamond engagement ring you choose for your loved one. Could one of these stunning designs be the one? Extraordinary Coast Diamond wedding set (LZ5001H-WZ5001H) with peek-a-boo diamond at the side of the head of the center diamond. Click image for details. Congratulations Lewis Jewelers of Moore, OK on 40 fabulous years of business and being our Coast Diamond Featured Retailer of the Week! It’s all in who you know and the Solomon Brothers of Atlanta, Ivan, Howard, and Anthony has native connections in the diamond industry from their upbringing in Cape Town, South Africa. It was Ivan Solomon who first chose Atlanta as his base after becoming a Certified Gemologist and Appraiser through the Gemological Institute of America (GIA). His brothers soon followed, and 30+ years later they are still bringing competitive pricing and high standards of brilliance to the fine jewelry business in Atlanta, Georgia. The ability to elevate the customer’s experience because of their loyalty to their customer and exceptional diamond craftsmanship is why Solomon Brothers Fine Jewelry of Atlanta is our Coast Diamond Featured Retailer of the Week. A Coast Diamond engagement ring is brought to perfection by the center stone of your choice. Whether you choose a brilliant diamond or a colored gemstone, personalizing a Coast engagement ring at Solomon Brothers is every Atlanta bride’s dream. The halo engagement ring tells your bride she is the center of your universe. The Modern Halo – Coast Diamond split shank engagement ring (LC5340) is an all time favorite of the Atlanta bride. The Perfectly Petite Halo – Coast Diamond two-tone engagement ring (LC5403RG) with a 1CT round halo set in white gold and petite diamonds cascading down a rose gold band (matching wedding band – WC5403RG). A three stone engagement ring represents your past, present, and future. The Sumptuous Oval Sapphire – Coast Diamond three-stone engagement ring (LSK10050-S) set in platinum is the most trendsetting choice for the Atlanta bride. Choose the shape of your colored gem center stone: cushion cut, oval or round. You can also choose the shape of the diamond side stones: trapeze, moon cut or round. Congratulations Solomon Brothers for being our Coast Diamond Featured Retailer of the Week! Where Your Holiday Proposal begins! Iannelli Diamonds, in the Diamond District of New York City, is the American Dream come true for two brothers from Southern Italy. Starting out in 1956 in Brooklyn’s Dyker Heights, as a neighborhood jewelry store, Iannelli grew over the next 20 years and moved to the largest shopping district for diamonds, New York’s Diamond District. Nearly 90% of the diamonds that enter the United States go through New York, and nearly as many through the Diamond District. So… There is no better place than our Coast Diamond Featured Retailer of the Week, Iannelli Diamonds, to find the sparkle for your holiday proposal. Your holiday proposal planning begins with the timeless glamour of a Coast Diamond engagement ring. As an authorized dealer of Coast Diamond engagement rings in New York, Iannelli Diamonds will partner with you in choosing the perfect ring and diamond for your holiday proposal. Whether she is traditional or trendsetting, every bride desires the timeless glamour of a Coast Diamond ring. The Timeless Coast Diamond 1 CT wedding set (LC5461-WC5461) with hand set diamonds on the shoulders of the ring and band. The Glamorous Coast Diamond 1.5 CT halo engagement ring (LZ5016) surrounded by sumptuous diamonds on the shoulders. The Ultimate Coast Diamond wedding band (WC5107H) with fishtail set diamonds. Anticipation is building for the holiday engagement season! Visit Iannelli Diamonds in the New York Diamond District for your Coast Diamond engagement ring. Congratulations to Iannelli Diamonds for bringing timeless glamour to New Yorkers for 60 years and being our Coast Diamond Featured Retailer of the Week! When you are shopping for something as precious and important as a diamond engagement ring there are few retailers with the tradition of service and value as Goldstein’s Jewelry of Mobile, Alabama. For 137 years (Yes, you heard it right… 137 years!) Goldstein’s Jewelry has been helping couples choose the perfect designer engagement ring setting and completing it with a beautiful diamond center stone. 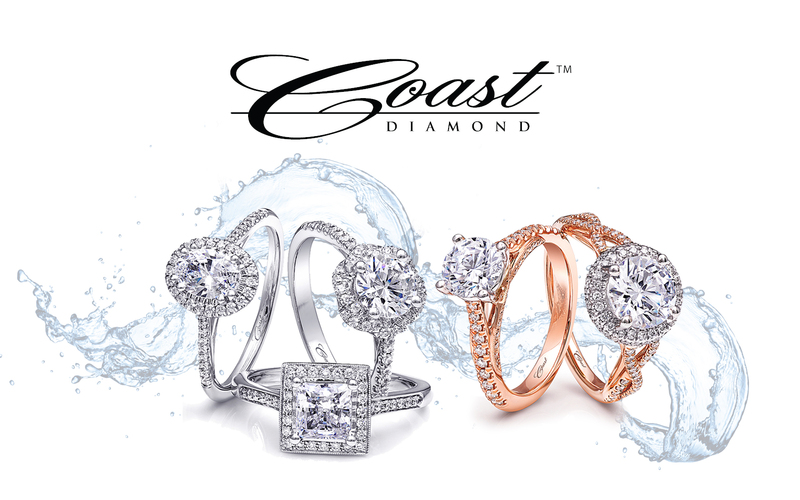 Coast Diamond is impressed with Goldstein’s longstanding tradition in the fine jewelry business and their drive to maintain their commitment to value and service and this is why they are the Coast Diamond Featured Retailer of the Week. The halo diamond engagement ring is hugely popular with celebrities like Natalie Portman, Carrie Underwood, Olivia Wilde, and Jessica Alba. Jessica Alba chose an Asscher cut diamond center stone for her halo engagement ring. It was important to Natalie Portman to have a certified conflict-free, mine-cut diamond center stone in her halo engagement ring. A yellow diamond center stone makes Carrie Underwood’s halo engagement ring gorgeously unique. And Olivia Wilde’s halo engagement ring features a round diamond center stone surrounded by an emerald halo. With so many options to customize a halo engagement ring, Coast Diamond has the ideal design for you to create your perfect halo engagement ring. is surrounded by a prong-set diamond halo and diamonds cascading down the shank of the ring. makes a complete set when paired with the round halo engagement ring above. The Coast Diamond Vintage Collection 1CT hand engraved halo engagement ring (LC6061) with a split shank is the perfect marriage of vintage and modern. Another Coast Diamond Vintage Collection hand engraved halo wedding set (LC6081-WC6081) is a dreamy choice for your contemporary bride. Congratulations Goldstein’s Jewelry of Mobile, AL for being our Coast Diamond Featured Retailer of the Week!